The West Indies bruised England’s egos as well as their bodies as Joe Root’s side suffered a painful start to the second Test in Antigua. 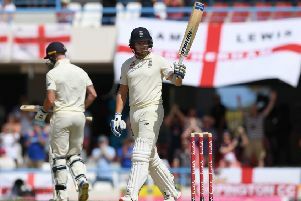 Thrashed in Barbados last week, England’s hopes of a big response came crashing down as they were dismissed for 187 on a lively - occasionally hazardous - pitch. Home captain Jason Holder chose to bowl on a green top at the Sir Vivian Richards Stadium and saw the clatter of wickets interspersed with a series of nasty blows. 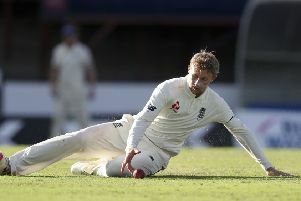 Joe Root, Ben Stokes, Sam Curran and Ben Foakes were all rapped hard on the gloves, the latter unable to keep wicket as a result, while top-scorer Moeen Ali was clattered on the helmet by Shannon Gabriel. Comparisons with 1998’s abandoned Test in Jamaica would be unwelcome and exaggerated, not least because the West Indies reached stumps on 30 without loss, seeing off 21 overs to undermine any concerns over the suitability of the surface. Only Jonny Bairstow (52) and Moeen (60) negotiated conditions well enough and the prospect of a series-deciding defeat appeared high as the tourists trudged off without landing a blow in response. Holder happily inserted England after winning the toss and saw his side pick up four wickets before lunch. Rory Burns was the first, held low at second slip pushing inconclusively at Kemar Roach. It was Roach who sowed the seeds of England’s match-defining 77 all out in Bridgetown and he was on the hunt again here with figures of four for 30. Debutant opener Joe Denly survived a highly precarious lbw shout on nought and eked out six runs before the day’s worst dismissal. Chasing a short, wide loosener from local boy Alzarri Joseph the 32-year-old stretched too far and sent a thin edge sailing into Shane Dowrich’s gloves. Root failed to settle but was hardly complicit in his dismissal, Joseph getting one to rear violently off a length. The ball thumped Root’s top hand as he attempted evasive action and it took a wonderful team effort from John Campbell and Shai Hope to complete the catch. Jos Buttler was promoted to five, leapfrogging Stokes, but lasted just 12 deliveries before Holder found extra bounce and picked up the edge. Watching from the other end was Bairstow, in a comparatively serene bubble of his own. He left better, offered the full face of the bat when bowlers over-pitched and played a pair of deliberate steers over the slips. In a lunch score of 78 for four, he was responsible for 52 of them. That rendered his wicket, two balls after the restart, all the more important as Roach sent one down at yorker length and won an lbw. Gabriel soon began working up a mean head of steam at the other end, pinging Stokes’ bottom hand as the all-rounder tossed his bat to the ground. Moeen was next in line, struck on the helmet by a well-aimed bumper. Stokes was undone by skill as much as speed, Gabriel coming from a wide angle round the wicket and precisely snaring the edge to leave England 93 for six. Moeen and Foakes went on to share a gutsy stand of 85, carefully watching for unpredictable bounce, running aggressively and taking on the spin of Roston Chase. Moeen, fresh from a pair in Barbados, reached his half-century in 69 balls but fell in ugly fashion, scooping Roach to mid-on. That was the first in a sequence of four wickets for nine runs as Gabriel and Roach cleaned up. Foakes (35) deflected a short one into his own stumps and injured his right hand in the process, Curran copped a painful blow before being beaten by bounce and James Anderson backed away to expose his stumps. England had over an hour to cause some chaos of their own but, despite a challenging spell from Stuart Broad, West Indies openers Campbell and Kraigg Brathwaite reached the close with their partnership intact.